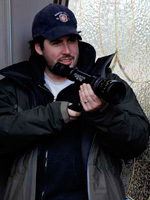 Is Jason Reitman the new Billy Wilder? I turned it over in my head a few times and, ultimately, I couldn’t think of a reason to disagree. One of Wilder’s most defining characteristics was his versatility, so it’s a bit early to draw a parallel there. That having been said, “Thank You for Smoking” is an entirely different film with drastically different themes than “Juno,” and “Up in the Air” looks to take things in a new direction yet again. Wilder may have exhibited less flash than Reitman, but he also placed a considerable emphasis on the screenplay. Despite Reitman’s panache (which is by no means overstated), his films, so far, have been very much made in the writing. And I’m with Breznican. It’s hard to argue that Reitman isn’t in some way interested in what lurks beneath the surface of daily niceties. It’s certainly there in “Thank You for Smoking.” And whatever your opinion of “Juno” (which became the victim of negative revisionism the moment it landed Oscar nominations for Best Picture and Best Director), that film, too, has an austere quality humming beneath the kitschy dialogue and idiosyncrasies. Obviously it’ll take a few more films before we really start considering this idea. And, of course, it isn’t really fair to box a filmmaker in with comparisons, but Wilder is one of my all-time favorites, while Reitman is an exciting new talent I greatly respect. So I thought it was worth bringing up. “Up in the Air,” meanwhile, is “rumored” to play here at Telluride over the weekend. What exactly do you mean by revisionism for Juno? Diablo Cody still walked away with the Best Original Screenplay Oscar. I hear people discount Juno criticism often, and I don’t understand the reasoning. I loved Reitman’s first film, and I was very excited for Juno – my hatred of the film during the opening Christmas night screening wasn’t from any other source than what was on the screen, and everyone I have talked to me seems to feel the same way. I am not terribly excited for Up in the Air, but I will certainly see it. As for the comparison to Wilder, I do see some similarities, certainly, but I have never been comfortable with comparing directors. I don’t think it’s out of bounds to say that people began suddenly hating on the film when it became an awards favorite. If you hated it from day one, good for you. Obviously the comment wasn’t aimed at you. The data points are certainly limited. N = 2 so far. Alexander Payne is probably closer with being humorous with darker tones. Is Tony Gilroy the new Paddy Chayefski? Is Christoph Walz the new Max Von Sydow? Is Zak Snyder the new King Vidor? Contrary to popular opinion, there is no new version of everything that we like coming out next year. Sometimes there are great men like Billy Wilder, whose films we appreciate, and when they die there is nothing there to replace them. There is no new Billy Wilder, nor will there ever be. Jason Reitman has enough of a hard time being an overrated director without this silliness. He suffers from this comparsion…. massively. limey: In essence, it was somewhat rhetorical. And I obviously added a note indicating that it’s unfair to box an artist in. But it’s meant to spur discussion. Though I have to ask: Is he really “overrated?” A big stretch to me. If an Oscar nod = overrated, then I guess Sally Kirkland is overrated, too. There are plenty directors I’d call “overrated” before Reitman. Richard: Maybe, but I think there’s a certain eclectic sense to Payne’s work that certainly wasn’t found in Wilder’s. Honestly, I wouldn’t know he directed Juno if his named wasn’t attached. That movie is Diablo Cody more than Jason Reitman. I’m also happy to say I hated Juno long before it became cool and I still find it almost unwatchable to this day. That says it all. This guy has many strikes against him – early Oscar nom, famous father Director, “it was Diablo Cody’s film”. The best thing he can do is keep cranking out funny, intelligent films and one day all of the people screaming overrated will start screaming underrated. No, Sawyer, then they’ll scream about how he’s all mainstream, man, and they know that won’t win them, like, popularity points, man, but they’re all about what’s QUALITY, man, not what’s popular. By the way, it’s interesting that people think a man who’s directed a staggering three films (one of which most of the world hasn’t seen yet) is already clearly inferior to the mind behind such recent triumphs as “My Super Ex-Girlfriend” and “Evolution”. This is a ridiculous comparison. I suppose I think both of Reitman’s films were entertaining but overrated, then I apply it to him. He’s certainly not the most overrated, but his ’07 oscar nod was a horrible call. As for the comparison… I don’t even remotely see it. Call me when Reitman makes his Double Indemnity, or his The Lost Weekend. I don’t think he has it in him. Heck, I don’t think he has a Seven Year Itch in him. What was Juno supposed to be? The Apartment? Some Like it Hot? If so, then not even close. Not in the same universe. If you’re going to say Juno received a backlash, then you also must admit that Thank You For Smoking suddenly became far more respected merely because of Reitman’s oscar nod. Now it has apparently fused together with Juno to create this supposed auteur facade that I just do not see. Reitman’s films are well-timed comically, and nicely put together… but I see no identity in them. As for Payne, perhaps he’s a bit more of an Ashby than a Wilder. And by the way, the last thing I’d call Reitman is an auteur. Ditto Wilder, while we’re on it. No idea where you’re getting your info but it must be an anti-Reitman forum or some such silliness. Honestly, I never understand some people’s desire to be as negative as possible as often as possible. Snark is out. It’s SO aughts. As a fan of Wilder, I don’t actually find the comparison blasphemous, just premature. Wilder was a major factor for two decades, and I mean MAJOR. Lets see how Reitman does in this next decade. I think Preston Sturgess may be a better comparison for now. This reminds me of when Signs came out and everyone started comparing M Night Shymalan to Steven Spielberg. Of course nobody thinks about that after the reception his last few films received. Premature is a good word. He’s directed 3 films, one of which hasn’t been seen yet by the masses. Let’s revisit this when his filmography grows a bit. Kris, I respect your opinion but I don’t see the need to call any criticism of your arguments “snark” every time people here disagree. I find the comparison ridiculous because I don’t see how you can =call someone the “new ___” after releasing only two films. Add that to the the fact that I think they’re two good/not great films that diverge in tone, style, and thematics (which you do acknowledge). If the comparison rests on an “emphasis on screenplay” and other similarly general characteristics, I can find you plenty of other directors that fit the mold. I just don’t see the value of using such generic categories. I doubt he’ll ever make anything as good as Sunset Blvd. or elicit as many great performances nut of his acto7 a7 Billy did. Thank You for Smoking was essential in getting Aaron Eckhart the Harvey Dent role in The Dark Knight. For that alone Reitman can do no wrong. The only reason anyone is being negative toward Reitman is because you’ve posited him as the heir apparent to one of the most beloved directors in film history. We’re not buying it. P.S. I found your ad hominem attack on my tone to be a bit… well snarky. I think Reitman is definitely an exciting new talent. I thought Thank You for Smoking was excellent, and Juno grew more irritating over time, but not because of Reitman’s direction – which was better than his direction on Smoking, more assured and confident in pacing and tone – but the damn dialogue by Diablo Cody. But Reitman, his films are still films to be excited about. Just don’t let Cody write them. Juno really has became the misunderstood masterpiece of the decade, it seems to me. People who hate it absolutely don’t get it, most people who love it absolutely don’t get it. It’s baffling how very few try to recognize any of the realism of the dialogue (eat your heart out, everyone who focuses on the titular character only when talking about “unrealistic dialogue”) and the way these human relationships develop. Cody has a really understated ability to develop a world consisting of the people we see in it, and thus it connects in ways that most films can’t even dream. Sure, she ripped half the thing from Ghost World, but Juno is a film that is almost haunting in its profoundness. To me, this is like asking if Stephen Daldry is the new David Lean. Can’t we all just put this into the “wait-and-see” pile of ideas. This guy is just starting, and to be honest, I loved both films that he made. Thank You for Smoking was a smart satire with smart dialogue and an intriguing cast, while Juno was a quirky but very sweet tale about getting through the bumps of life and the crazy solutions we may find to our individual problems, and I actually have no problem with the dialogue (it’s over-the-top, yes, but I appreciate it as a style and a voice). Juno also has a magnificent ensemble. He may not have made a film as good as Sunset Blvd. yet, but give him time. He may surprise us. And while I enjoy his father’s films as wacky comedies (Ghostbusters, his Schwarzenegger trilogy (Twins, Junior and Kindergarten Cop)), I’m a bit more impressed with the son thus far, just for making his films tighter, less formulaic and a lot smarter (and warmer in the case of Juno). I can’t wait to see Up in the Air (and see what George Clooney can do under his direction). And yeah, Billy Wilder is far more accomplished than Reitman will ever be, but the point that’s being made here comparing the two is more or less correct. The comparison is silly but they share the trait and it does work. Reitman is much more John Hughes than Billy Wilder. Thank You For Smoking just didn’t gel in my mind. Too slick, without much substance to back it up, but maybe the fault lies with the source material. Juno was pure Molly Ringwald material. And Up In The Air is sounding more like Planes, Trains and Automobiles than anything Wilder ever dreamed up. Plus, take a look at the life of Wilder. He was foreign to this country, on the run from the holocaust. He came from a background in journalism. He had the ultimate Outsider Perspective. I think his past and his background in news print is what gave him such brilliant insight. Reitman couldn’t be further from this. He’s a total insider. A silver spoon kid. Sure, Reitman is on the rise, but the only reason I think people are trying to give him this comparison is so he doesn’t get stuck with the more apt comparison to his father, a comparison which doesn’t do him many favors. I think once he has a few more films under his belt, the father-son comparison is the one he’ll be stuck with. But hopefully, it’ll be looked at as a Torch-Has-Been-Passed scenario, rather than the Nepotism-At-Work scenario. To be fair, this is an off-the-wall comparison, based on one (although insightful) similarity. And whether or not I liked JUNO, I’m certainly not going to resent Jason Reitman for crashing the Best Director race, with that branch’s long history of bias against both youth and comedy. As soon as I read the title, it clicked with me. Yes!, I thought. What a good comparison. If you had to be pressed to choose someone to compare, it would definately be Reitman. Of course he hasn’t made enough for that statement to ring true enough, but it’s a really interesting thought. Also, has anyone seen the short film he made? You can get it on youtube, called ‘Consent’? It’s hilarious! A very intelligent, hilarious short. He’s done a few other good ones, too. If you haven’t seen it, definately check it out. Jesse, I agree it is too early to compare Jason Reitman to Billy Wilder. I am definitely not a fan of “Juno” , but adored “Thank You For Smoking”. I do feel Neil LaBute , Sam Mendes, or even Curtis Hanson have some potential to be the next Bill Wilder. @Chad Hartigan: Huzzah! Best comparison yet. Jason Reitman is definitely an exciting new talent, that’s for sure. I thought THANK YOU FOR SMOKING was brilliant in every way and I loved JUNO, with my only issue with it actually being the script – too “cute” for my taste. So I’m really excited for UP IN THE AIR, another film, a la THANK YOU FOR SMOKING, that the director also wrote. I think this film will be more THANK YOU FOR SMOKING than JUNO which is fine by me. I love the comparison that Jason Reitman is the next Billy Wilder – though, I do think that he is carving out a reputation and a filmography that are very much his own. He’s a very original and versatile voice in cinema right now and I find myself looking more and more forward to UP IN THE AIR with everything I read about it.